Secondary Market Annuities are available to individuals through our Advisor Partners. Please contact us for a referral to an Advisor near you. For investors in the last few years before retirement, safety is the number one priority. Preserving your assets in a period of market volatility and protecting against loss is critical. However, safe money options like U.S. Treasury bonds, notes, bills, TIPS and CDs offer painfully low yields. Other safe money options like fixed annuities and index annuities offer compelling safety characteristics but for many investors, the surrender schedules, growth components, and poor yield, may make these options less appealing. Secondary Market Annuities are in fact Discounted Cash Flows. They are period certain guaranteed payments backed by annuities originally issued in conjunction with court ordered structured settlement awards. The annuities are issued by top rated insurance carriers. DCF Exchange selectively acquires these assets in a court ordered transfer procedure only after completing extensive due diligence and a legal review. We make these assets available directly to institutions and to individuals through our network of advisor relationships. A structured settlement is typically an award won by an individual in a court case or private legal settlement. When the plaintiff elects to receive his or her payments over time, the result is a structured settlement. The payments are backed by an annuity that is issued by a major insurance company. Which insurance carriers back these annuities? Typically, insurance companies such as MetLife, Travelers, Symetra, Prudential, and John Hancock are the names associated with these structured settlement obligations. These companies engender investor confidence with long standing high quality credit ratings. Through an established legal process guided by federal and state law, DCF Exchange is able to purchase payments from individual sellers and in turn make them available to you. The term ‘Secondary Market Annuity’ refers to structured settlements, immediate annuities, and lottery payments that are sold through specialty finance factoring companies by the original recipients of these payment streams. The term ‘Secondary Market Annuity’ is really just industry vernacular for ‘Factored Structured Settlement’ or ‘Previously Owned Annuity’ or even ‘In Force Annuity’. The most common SMA is much like a period certain multi-year guaranteed fixed annuity. But unlike newly issued annuities with yields in the 2 – 3% range, these cash-flows come with returns of 4% or 5% from the very same insurance companies. So who is a typical buyer of a Secondary Market Annuity? Secondary Market Annuities are great for safety-conscious investors seeking an investment with a fixed series of payments that handily beats today’s rates and inflation. If your client is currently invested in CD’s, cash, and bonds and looking for higher yields without shouldering any more risk, a Secondary Market Annuity is a great option to consider. CD’s are affectionately known as “Certificates of Disappointment” these days. Yields are so low that you are likely losing ground to inflation. A CD is a place to store cash for a short term – it is NOT an investment in this marketplace. If you’re invested in a 5-year CD paying 2%, you should take a look at a 5-year short term lump sum SMA, yielding anywhere from 3.5% to 4%. Of course, rates are market driven so these are subject to change, but…. The comparison is clear – SMAs have much higher yields. Period Certain Immediate Annuities are simply fixed term fixed payout contracts, such as 20-year payment. You purchase a defined income stream from an insurance company and they hold all the investment risk and must make the payout no matter what. Period certain annuities are what defendants ultimately purchase to fund structured settlements. With an SMA, you’re simply buying a period certain annuity, but AT A DISCOUNT. At current market rates, 20 year period certain annuities reflect an approximately 2% effective rate of return. With Secondary Market Annuities, a 20 year immediate income deal would have an effective rate of return between 4.25% and 4.5% depending on the deal and the situation. The comparison is clear- A Secondary Market Annuity pays more and cost less. Bonds, including Muni bonds, Corporate Bonds, and Treasuries, all carry one critical and terminal risk- loss of principal. As interest rates fall, bond prices go up…… and when rates rise, prices fall. When buying a bond you are buying the yield. But if you need to liquidate the bonds and the rates have risen, your principal value has diminished greatly. You lose money. Many people don’t really ‘get it’ when it comes to bonds- they think it’s safe, when really, it’s not. Instead, consider a high yield fixed investment in an SMA. 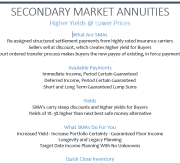 Secondary Market Annuities offer excellent yields and fixed terms. The comparison is clear- A Secondary Market Annuity offers a higher yield, without the risk of principal loss.